The HMPG’s journals cover a wide range of topics. We are a public-interest publisher and are committed to promoting the dissemination of knowledge through open-access publication and supporting the development of a robust evidence base for decision-making at all levels of the healthcare system, both in South Africa and beyond. 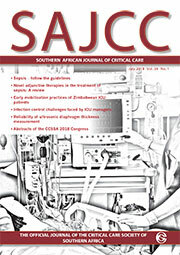 The SAMJ is a South African success story. Published continuously since 1884, it is the most highly cited academic journal of any discipline on the entire continent and is proud to have published some of the landmark papers in the history of medicine worldwide. The AJHPE is an online, quarterly journal for health professionals. 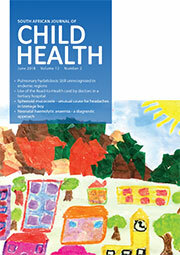 It carries research articles and letters, editorials, education practice, personal opinion and other topics related to education for health professionals. 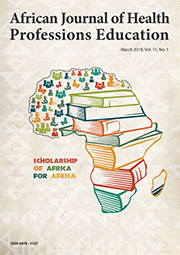 It also carrries related African education-related news, obituaries and general correspondence. Refer to the section policies for further information. SAJBL is an online, bi-annual, peer reviewed journal that covers matters related to ethics, law, human rights and related matters for the health professions. 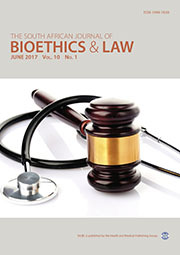 It carries research articles and letters, editorials, clinical practice, personal opinion and other topics related to biomedical law and human rights issues. 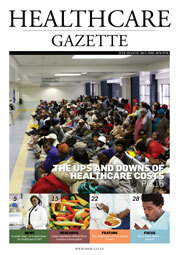 It also carries related South African health-related news, obituaries and general correspondence. 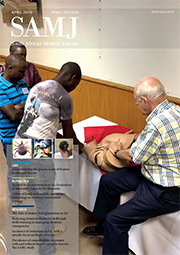 The SAJCH is an online, peer-reviewed medical journal devoted to all aspects of health and healthcare of neonates, infants and children, of particular relevance and interest to its southern African readership. The editorial board encourages research articles from emerging researchers and the publication of research conducted during postgraduate studies (such as the MMed). It carries research articles and letters, editorials, clinical practice and other child health articles and personal opinion, South Africa health-related news, obituaries and general correspondence. 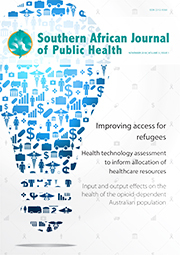 The core content of the SAJPH is original scientific reports and discussion papers on successes and failures in health system strengthening interventions worldwide, with a focus on identifying lessons that future programme designers and policy makers can learn from, and knowledge gaps to be filled through academic study. In recognition of the fact that success or failure depends on many external factors that may be unrelated to the technical aspects of project design, SAJPH will publish analyses of the political, social, cultural and economic environment of health systems interventions to further understanding of what works and what does not in specific contexts. Shorter comment articles on issues of controversy or debate in any area of health systems science or intervention are also welcome. 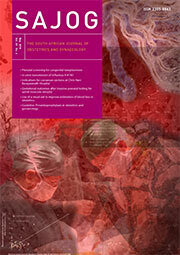 The AJTCCM is the official journal of the South African Thoracic Society. 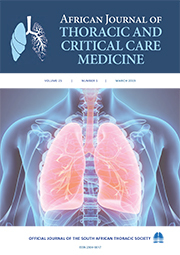 The journal accepts submissions relating to both clinical and basic research in the Pulmonology and Thoracic Surgery fields as well as state-of-the-art reviews on any topic related to the scope of the journal. 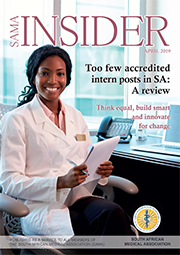 SAMA INSIDER is the official mouthpiece of the South African Medical Association. Topics covered in this publication relate to healthcare and the healthcare industry. SAMA INSIDER focuses on political and general news in the industry. SAJPRASB will focus primarily to provide a platform for academic support for local publications on Plastic & Reconstructive Aesthetic Surgery & Burns. We encourage original articles and local research and will strive to provide insight on recent developments in these fields. Secondarily we will be strive to support academics from the African continent as best we can. Articles from other countries will also be considered by our journal. Articles that are original and high levels of evidence will be given preference. For our impact we will endeavour to publish all relevant and interesting articles submitted in support of academic development. 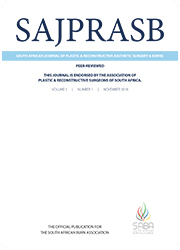 SAJPRASB is an official publication for the South African Burn Association and endorsed by the Association of Plastic & Reconstructive Surgeons of South Africa. © Health & Medical Publishing Group 2016. All rights reserved.